Active Members shall be those who shall play an important role in hosting society events, shall get voting rights and chance to get Diploma in Dental LASER from University of Vienna conducted in India by the Society (Details shall be conveyed) and be eligible to appear for Masters Degree Certificate at Vienna. Membership is open for all dentists of SAARC countries and other specialities who use Lasers in perioral region. Clinical & scientific sessions encompassing virtually all dental laser wavelengths. 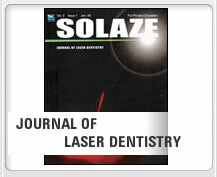 FREE access to the Society’s LASER Library.FREE subscription to the Society’s quarterly publication, featuring scientific articles and clinical case studies, developments in LASER dentistry, upcoming LASER events and Society news. — Applies to any institution whose sole purpose or primary activities are academic teaching or dental research. A designated primary representative will have full voting rights. Full-time staff are eligible for elected office . Institutions may designate up to two representatives. — Includes any for-profit or division that develops or sells dental equipments, supplies or services or seeks information, affiliation or interaction with the LASER dentistry community. Companies may designate up to two representative to receive Society mailings. Corporate members are non-voting. © SolaIndia.org, All Rights Reserved.